A nearly three-hour version of SportsCenter that included the postgame coverage of The NBA Finals averaged 1.292 million viewers and a 0.6 adults 18-49 rating to lead cable sports network programming on Tuesday. 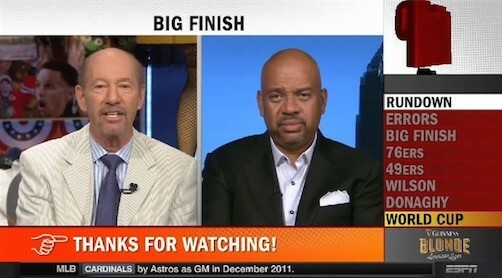 ESPN’s Pardon the Interruption averaged 886,000 viewers and a 0.4 adults 18-49 rating. Around the Horn averaged 606,000 viewers and Highly Questionable averaged 480,000 viewers. The Vanderbilt-TCU College World Series game on ESPN in primetime averaged 793,000 viewers and a 0.2 adults 18-49 rating. The afternoon LSU-Cal State Fullerton game on ESPN2 averaged 635,000 viewers and a 0.1 adults 18-49 rating. In FIFA Women’s World Cup action on FS1, Ecuador-Japan averaged 472,000 viewers and the Australia-Sweden match that went head-to-head with the USA-Nigeria Match on Fox (which averaged more than 5 million viewers) averaged 213,000 viewers.